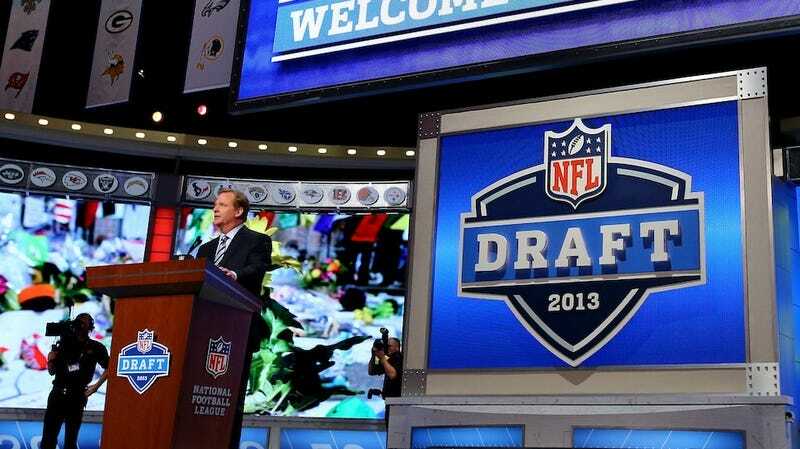 It might've been the heaviest NFL draft ever. That's about the only superlative you can slap on last night. A record 18 linemen, 5,650 pounds of linemen by one estimate, were taken in the first round of the draft. But the story is what didn't happen. Just five skill position players were selected. Not a single running back, the first time that's happened since 1963. Just one quarterback, the first time that's happened since 2001. The Patriots trading out of their pick just before a lengthy and awkward tribute to Boston. And, of course, no Geno Smith or Manti Te'o, the two most-mentioned players on both ESPN's and NFL Network's coverage. If there's a lede, it's the Bills. Sitting at the eight spot, they let it be known publicly and privately that they had West Virginia receiver Tavon Austin and Syracuse QB Ryan Nassib at the top of their board. That was a bit of a stretch, but it threw enough doubt into the proceedings to hook the Rams. St. Louis snagged Austin, which should make the loss of Danny Amendola easier to take. In return, the Bills added second- and seventh-round selections, and moved down eight spots in the first—and still got their man. Just not the one anyone expected. In a recorded phone conversation with Tampa Bay's Mark Dominik, Buffalo GM Buddy Nix rhapsodized about the importance of landing a franchise quarterback. You may have to reach for him, Nix said, but "if you get one, everything's easy." The Bills selected E.J. Manuel out of Florida State, not the second- or even the third-best QB on most boards. But he's exactly what Nix and Doug Marrone are looking for, in one of those windows where defenses haven't caught up with a shift in strategy—in this case, the read option. Manuel's a big man, with big hands and a strong arm, and he's a better runner than any quarterback on the board. He may not be ready yet, but the Bills rave about his "upside" and his "ceiling." He's a massive risk. In the last 20 years, this is only the fourth time no QB has been taken in the top three. The first signal-callers off the board those drafts? Chad Pennington, Jim Druckenmiller, and Tony Bank. That doesn't mean star quarterbacks can't be found mid-first round, or even later; it just means that when a QB class has been judged to be weak, it has tended to be judged correctly. It's not a huge surprise that Smith didn't get selected. That's the way the draft shakes out for quarterbacks who aren't top-10 overall types. By the time the first round gets to place they can be feasibly taken, it's the better teams, the ones who don't need a quarterback, who are left to pick. Smith will go early tonight. The Jaguars have the first pick of the second round, and if they don't use it on a QB, the Eagles, Cardinals, Jets, or Bucs surely will. It might be a little longer wait for Manti Te'o. Two linebackers went in the first round, and most boards have Kansas State's Arthur Brown still ahead of him.